When you are a kid, there is only one thing that separates you from having the ultimate fun, and that is gravity. That unfathomable, unmerciful force pulling you back to earth, right on your face, just when you were about to steal that apple from the neighbor’s tree. But, then something unbelievable happens. You watch the video for “Smooth Criminal” and Michael Jackson is shown beating the hell out of everyone while dancing and wearing a white suit. And then, with utmost ease, he leans 45 degrees and slaps gravity in the face, the world stops and nothing is going to be the same ever again. 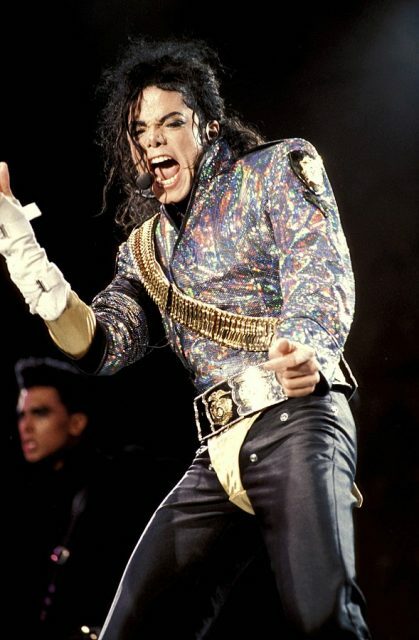 From then on, you know there are three things in the world: gravity, mortals, and Michael Jackson. However, time passes, you grow up and after a while realize that the best, most epic dance move in the world was not a result of Jackson’s “gravity-defying” dancing skills, but only a couple of invisible wires. So it was all a lie, and now we have to the tell the 6-years-old us that falling on our nose while trying that move was not our fault. When Michael Jackson did the epic 45 degrees lean in the video for “Smooth Criminal,” it was out of this world and completely blew everyone’s minds, so naturally, he wanted to re-create this dance routine live, on stage, and in front of everyone’s eyes. However, knowing that it would be “just a tad” more difficult to dance with strings attached while performing live on stage and without special effects to assist in post-production, the pop sensation got an idea of how to get it done and set forth to develop a special shoe in order to accomplish this maneuver. 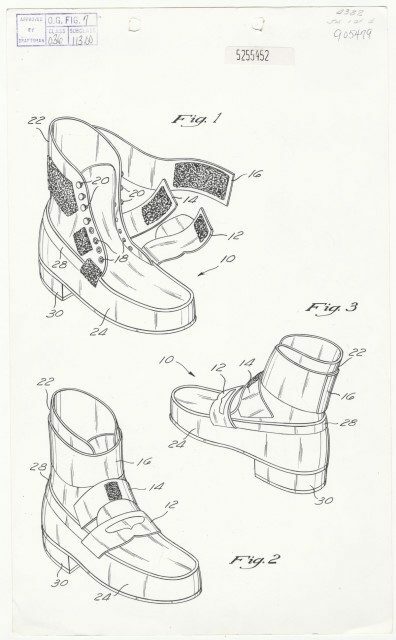 He, Michael Bush, and Dennis Tompkins (Jackson’s outfit designer) as co-inventors envisioned a hitching mechanism that was to be mounted on the floor of the stages where Jackson was about to perform, and specially designed shoes to complement it, thereby allowing those who wear them to lean without needing to keep their center of gravity directly over their feet. 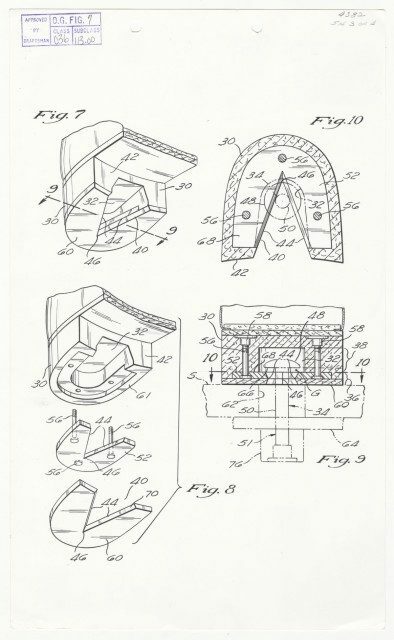 The system itself would consist of pegs that rise from the stage at the appropriate moment and special shoes with ankle supports and cutouts in the heels that can slide over the pegs and be temporarily fixed to the stage. The three of them, with the iconic star at the helm, somewhere around 1992 submitted their formal application to the U.S. Patent and Trademark Office, explaining the reasons why it should be granted. There are four general requirements that should be met when applying for a patent, according to United States Patent Law. 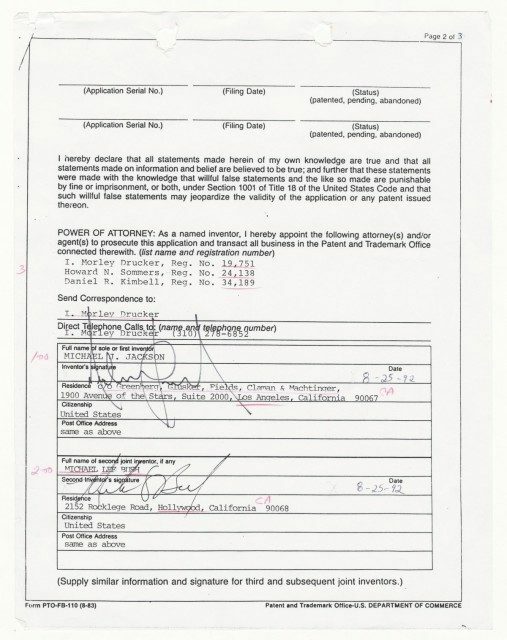 First, the subject matter in the application should be regarded as a patentable subject, or to put it plainly it should represent an invention of some sort. Second, it needs to meet the novelty requirement, to be new, wholly or in part, or according to intellectual property standards and various law firms, the “invention must not previously have been revealed in the public domain in any country or in any way,” and “must differ in some way from the prior art, the publicly known or existing knowledge in the field of the invention.” Third, it has to be non-obvious or have some form of an inventive step in it, and lastly, it should bring some usefulness along, or in other words has an industrial application, by presenting a new/ more efficient way of problem-solving. 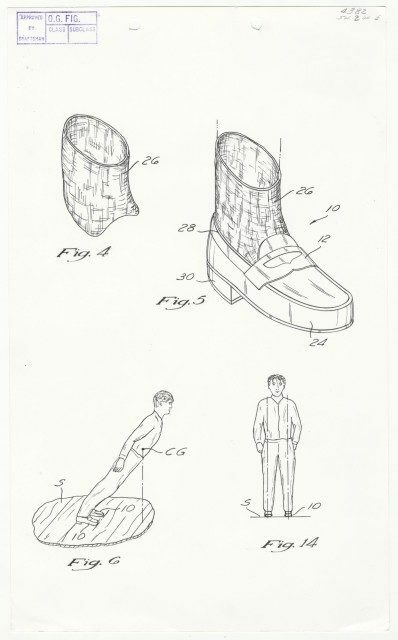 Their application was accepted, the invention proved to be patentable, and it seems it satisfied all requirements previously mentioned, for, on October 26, 1993, the U.S. Patent and Trademark Office officially granted their request for patent rights over “Method and means for creating anti-gravity illusion,” U.S. Patent No. 5,255,452. The illusion was just sublime, the shoes were working great, we all thought Michael Jackson was defying gravity, and everything was fine with the world. 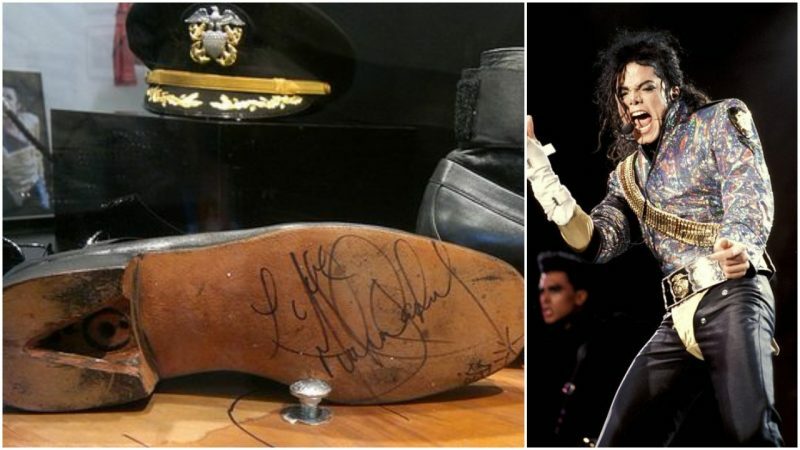 Until September 1996 when, during a concert in Moscow, one of the heels came loose from its peg and resulted in Micheal sensing the revenge of gravity when he went flying (but not in a good way) on the stage. As reported, the design was later revised and redone so such accidents can be avoided from ever happening again, and the broken shoe and its twin brother ended up in the possession of the Hard Rock Cafe in Moscow and remained there until after Jackson’s death. The superhero’s shoes were sold at auction for a whopping $600,000, and his immortalized dance lives on, along with the legacy he left behind. “On many an occasion when I am dancing, I have felt touched by something sacred. In those moments, I felt my spirit soar and become one with everything that exists. I become the stars and the moon. I become the lover and the beloved. I become the victor and the vanquished. I become the master and the slave. I become the singer and the song. I become the knower and the known. I keep on dancing and then, it is the eternal dance of creation. The Creator and the creation merge into one wholeness of joy”. “I keep on dancing — until there is only … the dance.” – Michael Jackson, inlay sleeve on Dangerous.